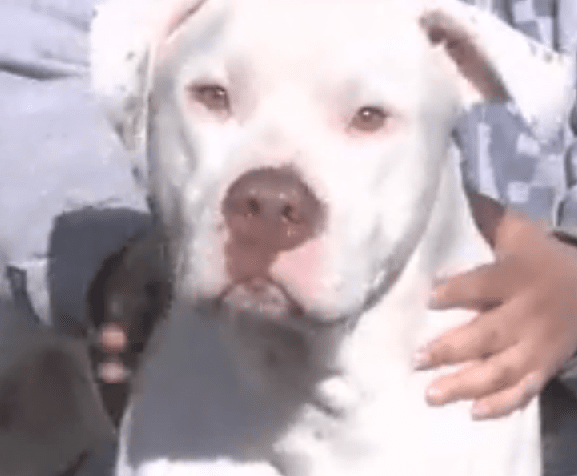 A fire in Niles, Michigan could have been a lot worse if a dog named Hector hadn’t come to the rescue. Not only did his barking alert his neighbors to the fire in their home, but he lead their four children to safety. Shell went outside to see what Hector was alarmed about. Hector immediately ran over to her neighbor’s home and Shell followed. “All of a sudden we came around the corner and we saw smoke coming from the house next door,” said Shell. She immediately called 911 as Hector continued to bark at the neighbor’s home. Good dog, Hector and what a great ambassador for your breed! i don’t like that term, “ambassador” – he’s not something unusual, he IS what the breed always was until ppl and the media screwed and skewed things around. ALL pit-type dogs are like hector if they’re raised and treated properly (assuming, of course, there are no medical or genetic conditions). Really threenorns? When was the last time YOUR dog saved 4 kids from a burning house?? Do you always like raining on others parades? This dog did a wonderful thing and deserves to be recognized for it! Hector should be living inside! My Dog Hector always slept inside with myself an my two children as a matter of fact he would sleep with my children in their bed. If a dog has shelter from the weather then there should be no problem with that dog living outside. Of course, all the usual – comfort; food; water; friendship n’ play, etc. – is included. I have a dog that gets to choose whether he wants to live inside or out. He CHOOSES to live outside. He’s made that his choice for the past 3 years – the door is always open if he wants to change and become an ‘inside’ dog. And, he has spent the odd night here & there inside so ‘inside’ is not foreign or scary to him. He just prefers to be outside. He’s spoiled rotten and loves his freedom! Why didn’t they mention he’s a bully breed? Any other breed would have been listed. He isn’t a “bully breed”. He may be an AST but that doesn’t make him a “bully breed”. Besides, what difference does it make what his breed is. . .he’s a hero! That would be like specifying whether a black or white man saved someone. . .what difference would it make?? An AST does in fact fall under the term “bully breed” and yes it does make a difference what breed of dog he is. ASTs and other pit bull type dogs need all the positive press they can get. Just think, if Hector would’ve been inside, he probably wouldn’t have alerted to the fire next door. His being outside, saved that family’s lives. This dog look like an American Bulldog, NOT a Pit Bull. It doesn’t matter, if it was an attack they would’ve called him a pit bull anyway, bulldog or not. Go Hector! What an amazing dog! He saved the neighbor’s children! It’s wonderful if he alerted his own ” human family”, but amazing that he saved the neighbor’s family. Dogs are truly “man’s best friend” and I am forever grateful for mine. What a wonderful story! Pit Bulls are actually nick-named ‘the nanny dog’ because they take such fierce care of a familys children.